“Exams don’t assess abilities, they merely provide a snapshot of the knowledge an individual has been able to retain at that given point in time,” wrote Peter T Howe, Principal of UWC Atlantic College in South Wales, UK, in an article for Tes in August. Can a couple of two-hour exams really reflect two years of learning? Remembering facts is not what it takes to be a success in the real world, it is vision, problem-solving, practicality, realism, communication, compromise, teamwork and community building that are important, he argued. By their very nature, exams can’t measure all of these abilities. Yet as, Matt Glanville, Head of Assessment Principles and Practice at the IB, points out, “although detailed knowledge recall is of less use in today’s world, an argument can be made that broad knowledge is essential to frame your initial ‘search’”. IB assessment isn’t about regurgitation of facts. It is about analysing and presenting information, evaluating and constructing arguments, solving problems creatively, understanding key concepts and applying knowledge in real-life situations. 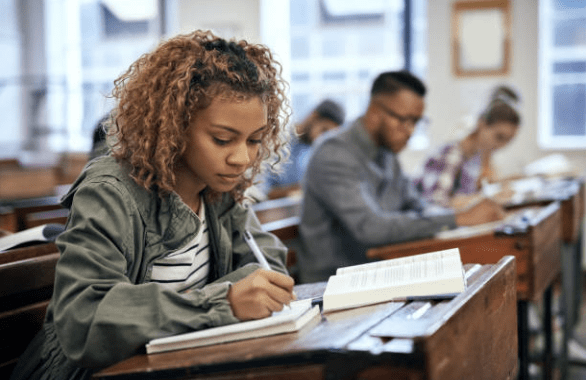 Exams remain a topic under continuous review along with the quest to provide a meaningful experience for IB students as they prepare them for their adulthoods in the world. Removing exams from education altogether may not work in real life, nor be equitable and fair to students. As Glanville says: “For most countries across the world the purpose of the final assessment is selection, either for further educational study (university) or employment. This creates two problems; firstly, any grade must be unique to the student, limiting the role of teamwork and secondly it needs to differentiate between students. The IB is committed to ensuring its exams and assessments are a fair reflection of students’ abilities, contributions and learning. She maintains that the IB must keep evolving as we enter the fourth industrial revolution, and assessments need to prepare students for this change. “Their careers are beginning in a changing economy so we must continuously question why and what we assess,” she said. Wilcock said there might come a point in time where the IB has open book assessments, where it will be acceptable to use the internet in an exam. But the IB has to work out how to assess how this internet content would be used. Technology is also now at a point where it can facilitate point-in-time formative, interactive and authentic assessments in the classroom with real-time feedback and adaptive learning. “Examinations, particularly in the digital age, have the opportunity to test problem-solving, communication and most exciting of all, how the candidate responds to being given ‘new’ information when working through the question—this is impossible in a paper examination where the student can just read ahead,” says Glanville. The IB has pioneered the use of technology in assessments with the launch of the MYP eAssessment in 2016. Director of IB World Schools, Adrian Kearney, wrote a blog post last year on how technology allows the IB to keep assessment relevant. He said that the MYP eAssessment “pushes students to go beyond the rote memorization of content; just 25% of the assessment is based explicitly on knowledge and understanding – the rest focuses on inquiry, communication, and critical thinking skills”. We need to keep reviewing the way we assess students so it is fit for the future. “As the education sector continues to catch up with the rapid pace of technological advancements seen at home and in the workplace, examination boards must work together to understand and develop assessment models that measure what we predict will matter in tomorrow’s world,” wrote Kearney.